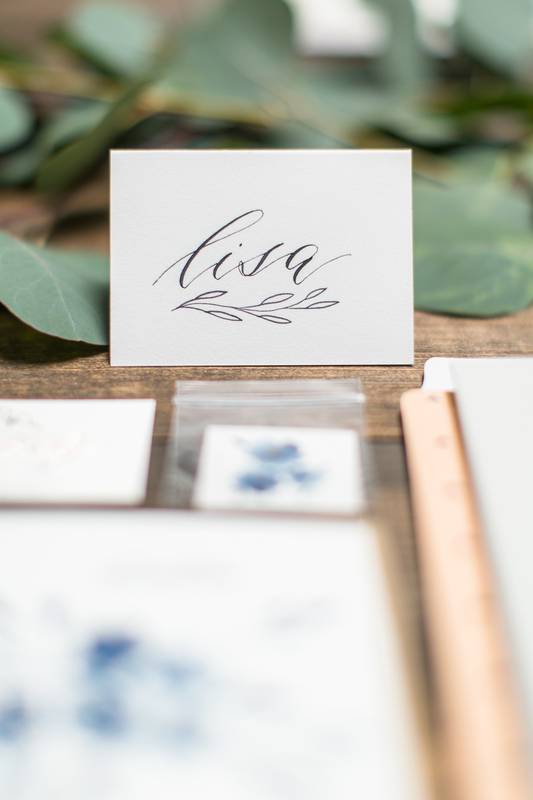 As some of you may know, I taught my first modern calligraphy workshop a few weekends ago. It was such a fun day and I could not have asked for a better first workshop experience. From the wonderful vendors that I collaborated with, to my talented students, and my amazing friends that showed up to offer support -- everything was perfect! I was fortunate to be able to collaborate with a handful of San Diego creatives to make this workshop a beautiful (and tasty!) event for all of my students. 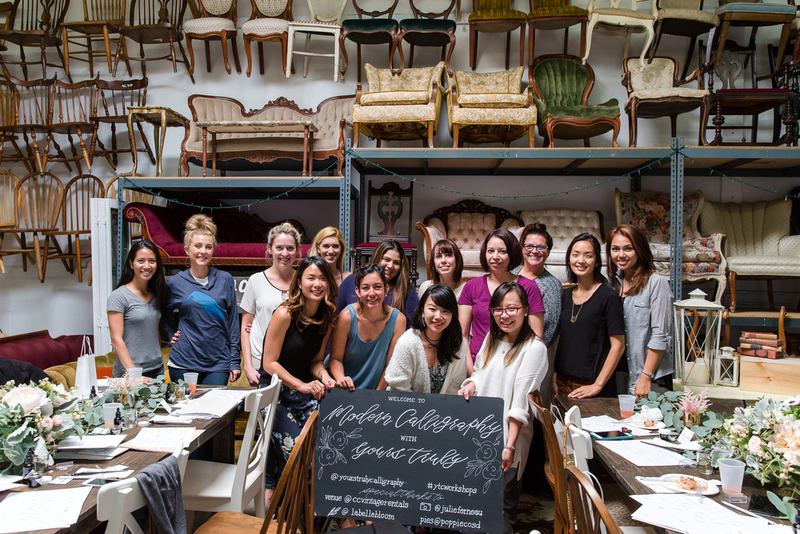 We held the workshop at CC Vintage Rentals, which was filled with amazing vintage furniture and Not My Dish tabletop rentals. Julie of Julie Ferneau Photography was on site to capture all of the details. The delicious pies (coconut cream, earl grey and chicken pot pie) by Pop Pie Co were a huge hit. These gorgeous florals by La Belle Bloom tied everything together and made the whole venue and the tabletops look beautiful. I loved how everything looked all set up and ready to go. Each student received a modern calligraphy booklet (custom designed by yours truly) and a curated beginner's toolkit of some of my favorite calligraphy materials. I also added my "Hello, Gorgeous" card and indigo floral temporary tattoo for everyone to take home. More captures by Julie of the workshop and my students hard at work. Thank you, to all of my workshop attendees! Special thanks to a few of my #calligrasisters who came out to support me: Grace and Nina of Calligraphy Companion, Younghae of Logos Calligraphy and Alice of Lace & Lettering. Friends, the calligraphy community is so uplifting and supportive, and I am so grateful to have met these ladies early on in my calligraphy journey. You should check out their workshops, especially if you are interested in traditional calligraphy scripts and letter forms. Calligraphy, particularly modern calligraphy, is a continuously evolving process. As I told my students, whether you are just beginning or have been practicing calligraphy for quite some time -- keep practicing and aim for progress, not perfection. And most importantly, have fun! My first modern calligraphy workshop was a success and I am excited to teach more workshops (including watercolor florals) in the future. Please stay tuned for upcoming workshop dates!